Marussia have not introduced any large upgrades so far this season. In season development being just small iterations of front wing and cascade design. For Silverstone the team have produced what Team Principal John booth called “our first proper wind-tunnel generated upgrade”. This being a reference to the new Technical team’s focus away from CFD only development. Booth also identified the upgrades as consisting of “new rear wing, exhausts, floor and side pods”. This package was fitted to the car for the ill fated Duxford test last week. It has reappeared at Silverstone for the GP and its clear the sidepods are step away from the launch specification exhaust set up. Where as the car has raced with top exit exhausts, exiting through the rear suspension so far this year, the new sidepod moves towards Saubers early season design. 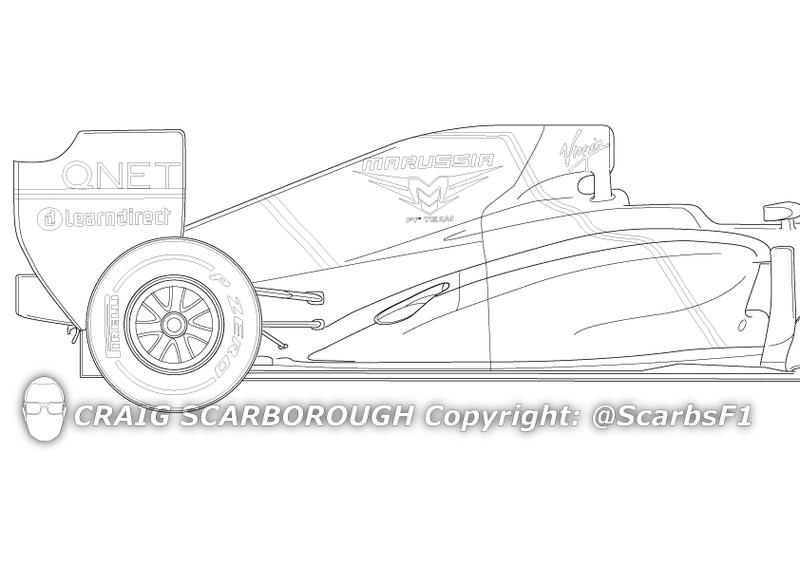 The exhaust tail pipes are now moved towards the outer edge of the sidepod and exit through a small down swept duct. 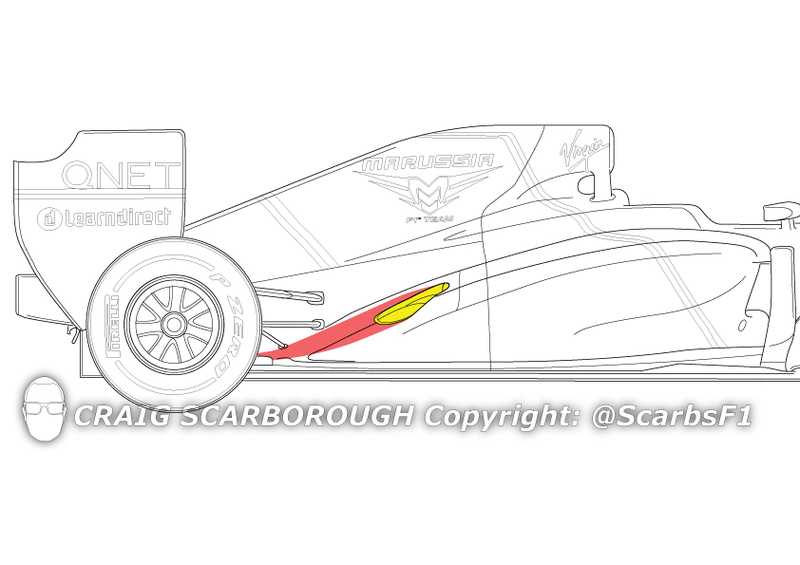 The sidepod bodywork then forms a ramp for the exhaust plume to follow down to the diffusers footplate. This set up worked well for Sauber earlier on this season, before they followed McLarens path, with an exhaust exiting through a bulged pod in the side of the car. Having a blown effect at the diffuser means Marussia should be able to extract more downforce from the car. Both from the extra mass flow through the diffuser and the sealing effect of the exhaust plume allowing greater rake to be set up on the car. This development is long overdue, with the fight with Caterham now being made more difficult, as they have also introduced an exhaust blown diffuser set up this weekend. Footnote: My thoughts are with Maria de Villota, her Family and the Marussia team after the dreadful events earlier this week. This entry was posted in F1 2012, Marussia MR01 by scarbsf1. Bookmark the permalink. My same exact thoughts on the footnote, scarbs! I wish she has a speedy recovery and still can life a prosperous life. I totally agree. My thought are with her and the team. Good luck. What about other Marussia updates? The rear wing, the sidepods, the nose seems to be different as well. I have more updates on car development following my trip to Silverstone. Will post soon.